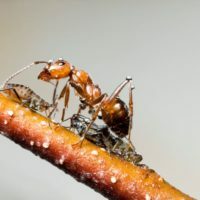 Home » Blog » Why Does the Stinging of Ants Cause Pain? Why Does the Stinging of Ants Cause Pain? Ants create large colonies, which makes them social creatures, but that doesn’t mean that they are friendly with humans. In fact, they are often a nuisance, especially when they invade homes. Some ants are less than friendly to humans, particularly those that bite or sting. The stinging of an ant can cause pain, and understand the cause of that pain and how to treat it can help you. First, you should identify ants that sting and cause pain. Red pavement ants sting, but the venom released by the sting is not poisonous. However, it may result in an allergic reaction, especially if you have sensitive skin. You can identify red ants by their colouring, which is either blackish brown or reddish brown. You find them walking around near sidewalks, driveways, and other areas with the pavement. They will also invade your home if they find it a suitable source of food. The red pavement ant is small at 2.5 to 4mm in length. The fire ant is another ant that stings. In fact, they bite and sting. It will use strong mandibles to pinch the skin and pull it to raise it up. It will then arch the abdominal area under itself to sting the raised portion of skin. The fire ant is sometimes called a red fire ant because it has a light brown colour that makes it look red. However, some fire ants are black, thus known as black fire ants. However, the bite and sting of a black fire ant is not as painful compared to the bite of a red fire ant. The fire ant is about 1/8 of an inch in length. If you are stung by an ant, it will cause you pain. Typically, the area at and around the sting site will swell and become irritated. When the ant stings, it injects venom through the stinger. Pavement ants do not have poison in their venom, so the reaction is usually mild. However, the swelling and irritation will cause discomfort and pain. A sting from a fire ant is usually far more painful than that of a pavement ant. The pain feels like intense burning. The area will turn itchy, red, and swollen. You may also notice the development of a pustule, which is a pus-filled bump. Too much itching may irritate the area and lead to infection. If you recognize any of the severe symptoms above, seek medical attention immediately. If you receive a sting from an ant, use your sleeve to brush them off. If you use your bare hand, they may use their mandibles to attach to your skin and keep biting and stinging you. Make sure you take antihistamines to control your reaction to the sting. Also, consider the use of pain relievers to decrease the painful burning sensation caused by the sting. To provide even more relief, place a cold pack over the affected area of your skin. The cold pack will reduce inflammation and pain. Do not hesitate to contact your physician or visit the emergency room if you feel like you are having any serious reactions to the sting. If pavement or fire ants are a problem in and around your home, contact a pest control professional. An expert can remove these pests from your home so you do not have to deal with their uncomfortable, and sometimes dangerous stinging and biting.